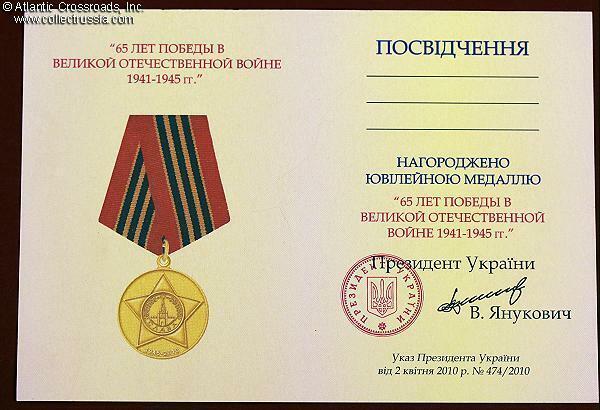 Certificate for the Medal for 65th Anniversary of Victory over Germany, awarded to all surviving WW 2 veterans in Russia and the former Soviet Republics. 6 3/8" x 4 3/8". Text on the right is Ukrainian although the name of the medal on the left is in Russian. 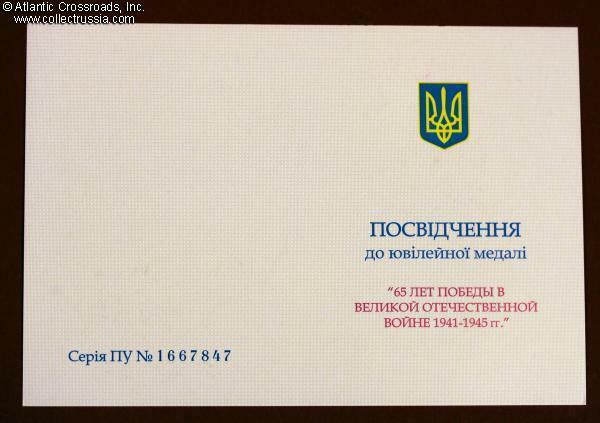 Shows facsimile signature of the Ukrainian President Viktor Yanukovich. Serially numbered on the back (each document has its own unique number). As can be seen from the artwork, the medal features the image of the Order of Glory with the dates 1945-2010 and is identical to the jubilee medal awarded by the Russian Federation.